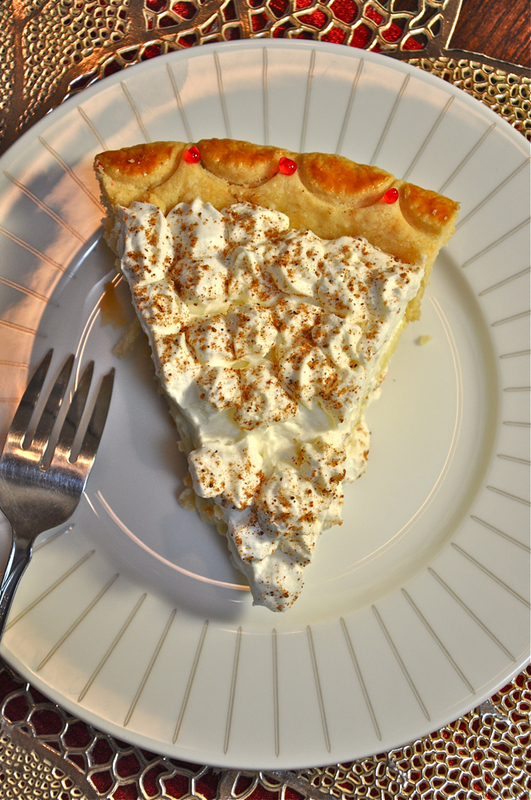 It’s time to cut loose on the pie dance floor. You’ve dutifully baked your way through the seasons and Thanksgiving, paying your respects to apple, pumpkin, pecan – all manner of traditional pies. You’ve earned something a little outlandish and over-the-top, wouldn’t you say? Maybe something a little naughty and nice all in one crust? 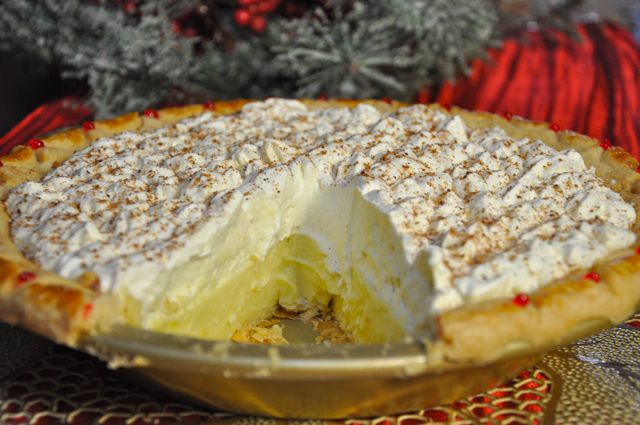 How about Eggnog Cream Pie? Never heard of it? Let me help. 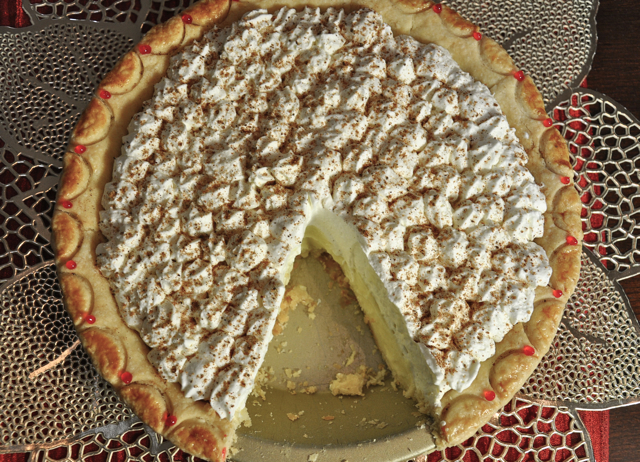 Imagine your basic vanilla cream pie, the kind roadside diners everywhere are famous for. Add half milk and half heavy cream to the filling, for unabashed eggnogish creaminess. Incorporate half a dozen egg yolks for a velvety texture. Fold a portion of the aforementioned filling into clouds of whipped cream; pile a mountain of it over the filling; booze the whole thing up with bourbon. Dust lavishly with nutmeg. You’re done. Yes, it tastes like eggnog. And no, I never said it earned the American Heart Association’s stamp of approval, but no matter – everyone else will approve. You could make a strong case for doing this holiday pie in a prebaked crumb crust made from vanilla wafers, gingersnaps, or graham crackers. I wouldn’t discourage you. But I opted for the prebaked pastry crust because I wanted to make a decorative border, suggestive of the season. If you like the look, here’s how I did it. Choose a pie pan that has a flat rim at least 1/2-inch wide. Make a beefy rolled or pinched edge on your pie shell, then flatten it out to a thickness of about 1/3-inch, by hand or with the help of a large pan bottom. Chill the pie shell in the freezer for about 7 minutes, or in the fridge for at least 30 minutes. Using the edge of a round teaspoon, make deep impressions in the rim all the way around, using about half of the spoon’s circle to make the impression. Chill again while you preheat the oven. Just before prebaking the shell, use a small brush to paint the half circles with 1 egg yolk beaten with 1/2 teaspoon milk. After the filling and topping go on, I added those drops of red decorating gel for a festive touch. A word of caution if you do make this with a pastry crust: make sure it is fully prebaked. All of your bona fides will fly out the window if your crust feels flabby in the mouth, with no trace of the requisite crunch. Once you remove the foil and beans during the prebaking it will need another 15 to 20 minutes at 350°, until the surface of the shell is nice and dry and you notice a little browning on the bottom crust. 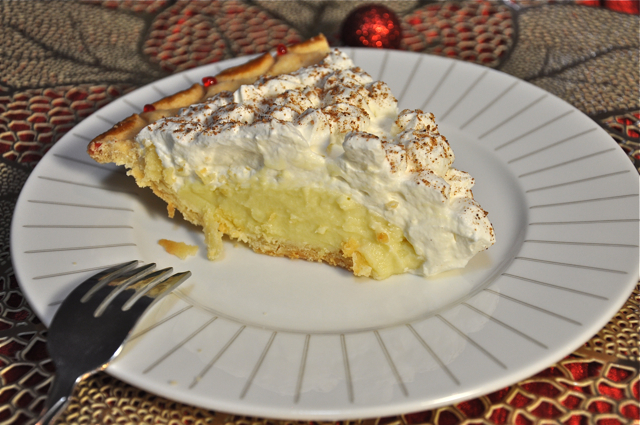 I’m not a hard liquor fan, and one of the many things I like about this pie is that you can taste the bourbon, but – unlike a lot of actual eggnog – there’s not enough to knock your socks off. Enjoy, and happy holidays to you. 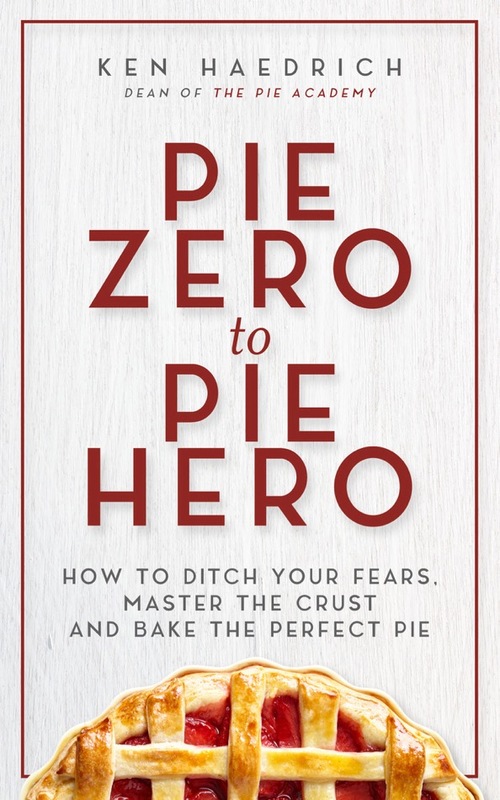 Need Last Minute Gifts for Your Favorite Pie Maker? 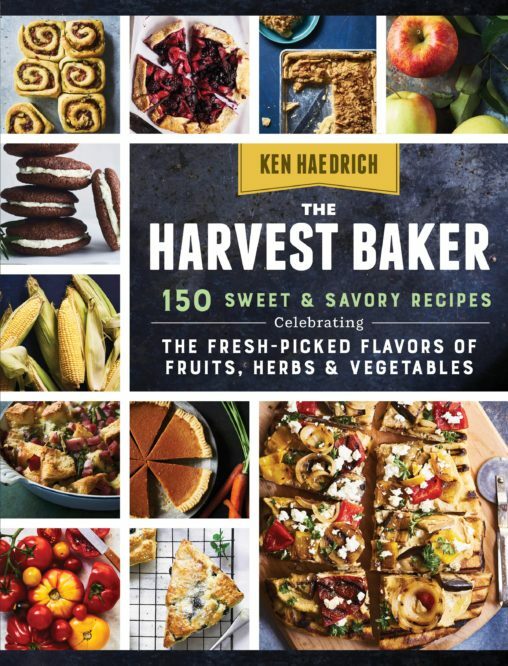 We’ve got some great ones: a variety of pie boxes, heirloom quality Pie Academy rolling pins, Ken’s cookbooks – he’ll be happy to autograph them for you – and more. Have a look around the store and place your order by Saturday if you want to be sure it will arrive before Christmas. And as always, thanks for your support. 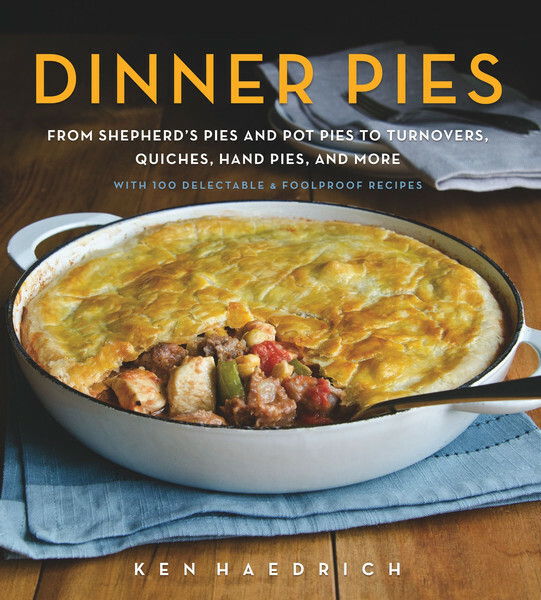 If you or someone you know loves dinner pies, Ken’s collection of savory pies is a must-have. PIE CRUST NOTE: As I mentioned above, use any favorite crumb crust for this pie, prebaking the crust as directed. If you would like to use a pastry crust, I recommend the Good Basic Pie Dough, Food Processor Pie Dough, or the Three-Grain Butter Crust. If you haven’t already, prepare the pie dough and refrigerate it for at least 1 1/2 to 2 hours before rolling. On a sheet of lightly floured wax paper, roll the dough into a 12 1/2- to 13- inch circle. Invert the pastry over a 9-inch deep-dish pie pan, center it, then peel off the paper. Gently tuck the pastry into the pan without stretching it. Sculpt the overhanging dough into an upstanding ridge and flute, if desired. Prick the bottom of the pie shell 6 or 7 times with a fork. Refrigerate for at least 30 minutes or place in the freezer for 15 minutes. Combine 1/4 cup of the sugar, the cornstarch and salt in a large mixing bowl; whisk to combine. Whisk in 3/4 cup of the milk and the egg yolks. Set aside. Combine the remaining 3/4 cup milk, the heavy cream and remaining 1/2 cup sugar in a medium size saucepan. Bring to a near boil, whisking almost nonstop. Remove from the heat and then - using a ladle - very slowly whisk about one-third of the hot cream mixture into the egg yolk mixture. (This will "temper" the eggs so they don't curdle.) Slowly whisk the tempered egg mixture back into the remaining milk in the saucepan. Gradually bring the filling to a boil, whisking continuously. When it begins to boil thickly - watch out for spatter; it can burn - whisk nonstop or stir well with a wooden spoon for 1 1/2 to 2 minutes; it will become quite thick. Remove from the heat and whisk in the butter, 2 tablespoons bourbon, and vanilla until smooth. Immediately pour about three-quarters of the filling into the pie shell; smooth with a spoon. Pour the remaining filling into a small bowl. Place a piece of plastic wrap directly on top of each portion of filling, leaving no gaps. This will prevent the filling from forming a skin. Cool, then refrigerate both fillings for at least 4 hours, or overnight. MAKE THE TOPPING: Thirty minutes before you make the topping, refrigerate a mixing bowl and the beaters of your electric mixer. Pour the heavy cream into your mixing bowl and beat on medium speed until it starts to mound and thicken. Add the sugar a tablespoon at a time, and beat briefly, until the cream holds soft peaks. 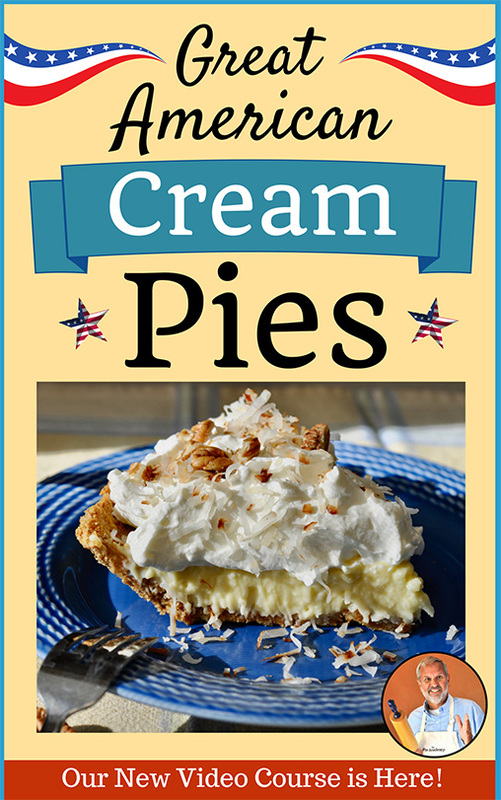 Add the reserved filling to the whipped cream, spooning it here and there, and continue to beat on medium speed until the mixture is thick, creamy, and evenly combined. Mound the topping over the filling. Dust the top of the pie generously with nutmeg. Refrigerate until serving. Makes 8 servings.